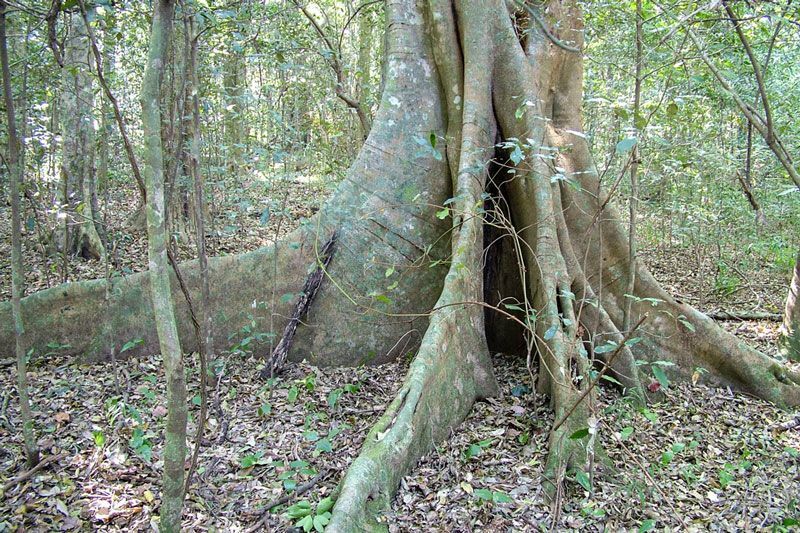 This article profiles some of the significant tree species protected in the Krantzkloof Nature Reserve, including rare, range restricted and threatened species. The South African National Biodiversity Institute, better known as SANBI, uses the IUCN Red List Categories and Criteria in preparing the Red List of South African plants. The system measures a species’ risk of extinction and highlights species that most urgently need conservation action. Due to the focus on extinction risk, the IUCN system does not highlight species that have a low risk of extinction, but which may be of high conservation importance. SANBI has adapted the IUCN system to allow for flagging species that have a low extinction risk but which are of conservation concern. The IUCN system also allows for assessments of part of a species’ global range, e.g. for a country. Therefore a species’ status on the national Red List may differ from its global status on the IUCN Red List. Threatened species include Critically Endangered Possibly Extinct, Critically Endangered, Endangered and Vulnerable species. For more, see the SANBI Red List. There are over 300 extant cycad species in the world and the genus Encephalartos, which is confined to Africa, includes over 60 species. 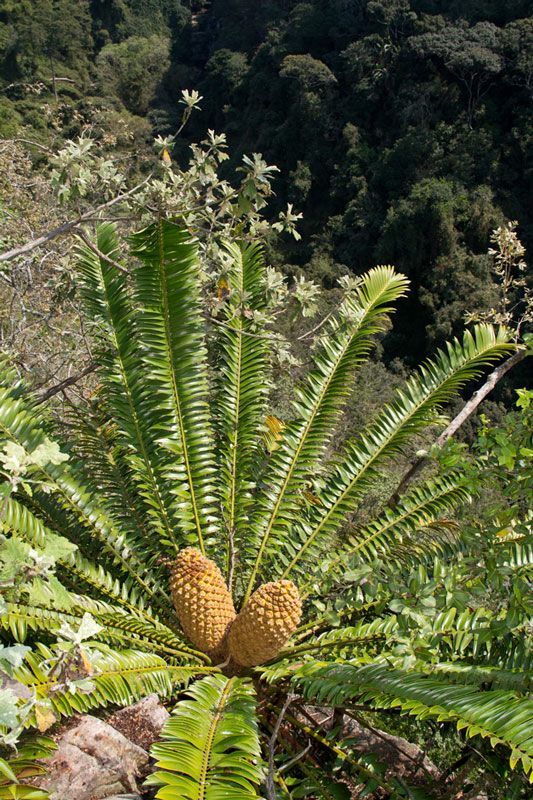 The glory era of the cycads spanned the Jurassic and Cretaceous from 200 to 65 million years ago. Modern cycads descended from these gymnosperms, but the current diversity is a result of rapid evolution beginning only 12 million years ago. E. natalensis is near endemic to KZN and in Durban occurs in groups or singly on krantzes and other inaccessible rocky places. Elsewhere plants may be found on rocky outcrops. The Natal Cycad is considered Near Threatened because populations have declined as plants are plundered by collectors or fatal damage is inflicted by umuthi harvesters when bark is removed. Fortunately Krantzkloof’s specimens are mostly protected by their cliff habitat, but the same can’t be said for the type specimen at Monteseel, which was declared a Provincial Heritage Site in 1951. The original rootstock of this clump is estimated to be 1 000 years old, but sadly this beautiful clump of plants has been severely damaged by bark harvesting, a practice that is hard to control. The reproductive organs of cycads are cones with male and female cones produced on separate plants. In this species, the cones are orange-yellow and the female cone is conspicuously stouter than the slender, cylindrical male cone. Seeds are scarlet and distributed by birds, monkeys and baboons, which eat the flesh and discard the toxic kernel. New growth may be stripped by the larvae of the Leopard Magpie Moth Zerenopsis leopardina. The Sandstone-laurel is a rare and Endangered evergreen tree, which grows in scarp forest where it is often found along streams. The species was only described in 1973 by Jim Ross who was curator of the Natal Herbarium. It occurs in scattered forests from Ongoye near Richards Bay, where it may be extinct, southwards to the Msikaba River in the northern parts of the Eastern Cape. 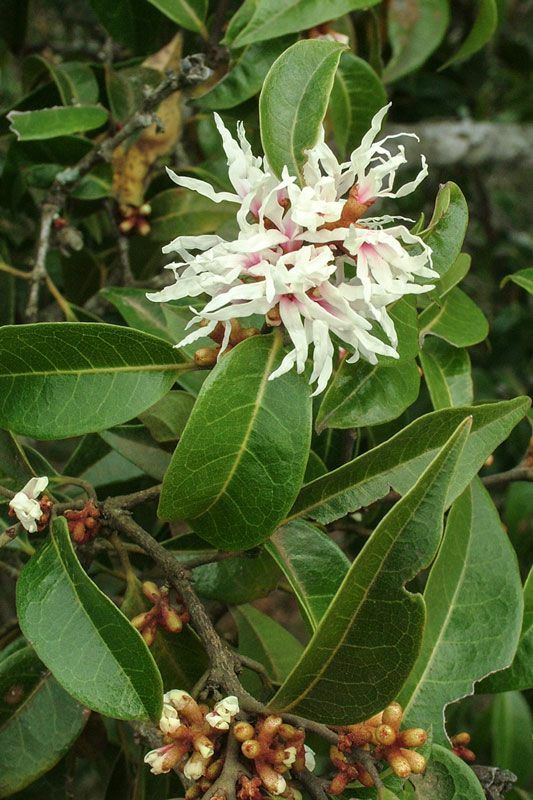 The Sandstone-laurel is commoner in Pondoland forests than in the north and the total population is probably no more than 200 trees. It grows mostly on soils derived from sandstone, hence the common name. The species’ range includes Durban where it is known from Inanda Mountain and the Krantzkloof Nature Reserve, and fewer than 10 trees are known. Trees reach 20 m in height and may be single-stemmed or frequently grow as a ring of coppicing and hollow-centred clumps. 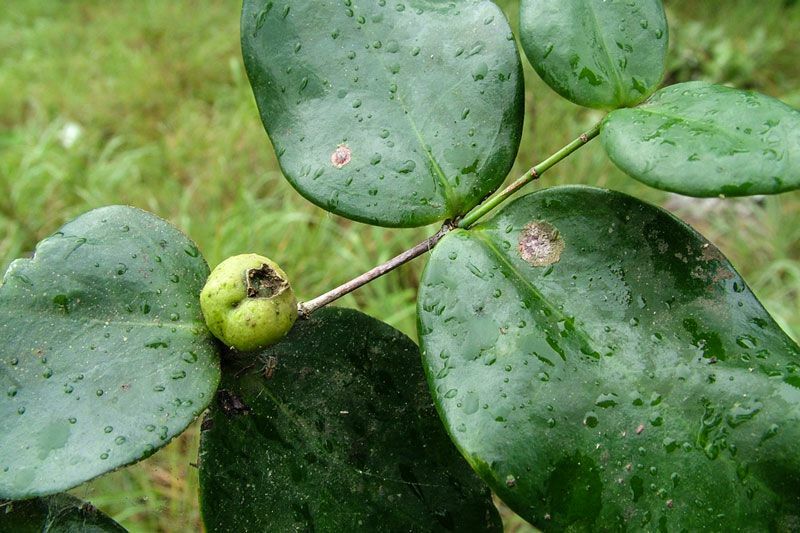 Leaves are opposite, which is unusual for the family, shiny and are often blemished with characteristic insect galls. New leaves are reddish. The flowers are tiny and greenish-yellow. The fruit is round, greenish-yellow and about 20 mm in diameter. The species reproduces from seed very infrequently and is probably on the brink of natural extinction. This is the only member of the genus and is considered to be a palaeoendemic, a formerly widespread evolutionary relict, on its way to natural extinction. The genus name honours R.M.T. Dahlgren who was a Swedish botanist interested in southern African flora. Wood’s Spikethorn, whose aerial parts reach only 60 cm in height, is one of a number of South African ‘underground trees’ that grow in colonies with connected, large subterranean, woody lignotubers and short, shrub-like aerial parts. Many woody savanna species have evolved to live underground to escape fire, in the main. The technical term for the growth form is a geoxylic suffrutex. The genus Gymnosporia includes a number of geoxylic suffrutexes (or suffrutices) as well as shrubs and small trees. Members of the genus were formerly included in the genus Maytenus. Maytenus species are spineless and have bisexual flowers whilst Gymnosporia species have spines and male and female flowers on separate plants. G. woodii was discovered near Inanda by ‘the father of Natal Botany’ John Medley Wood who was an early curator of the Durban Botanic Gardens and founder of the Natal Herbarium. 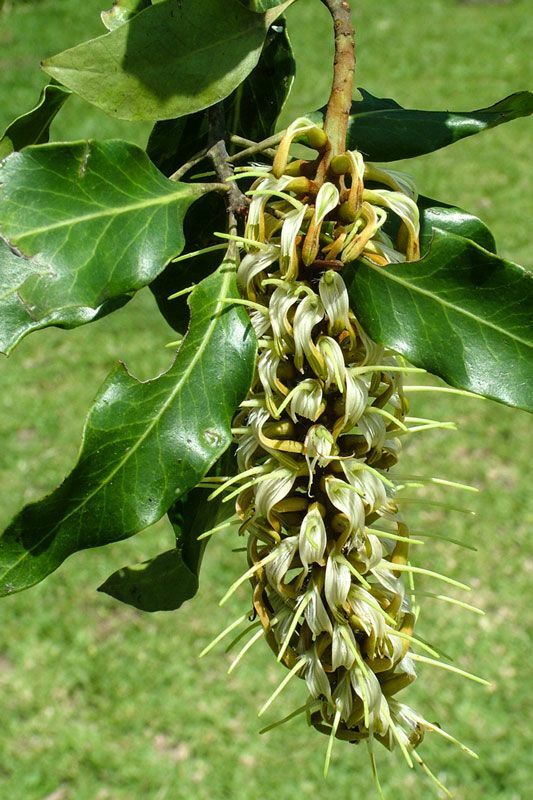 Wood’s Spikethorn is the only ‘tree’ endemic restricted to the eThekwini Municipal Area where it is known from less than 10 populations, which are all relatively small. It is classified as Endangered in the national Red List of South African plants. The species ranges from the vicinity of Inanda or Matata Mountain to the New Germany Nature Reserve. It is yet to be recorded in the Krantzkloof Nature Reserve, but it occurs nearby on a protected, municipal-owned site in the Nkutu River valley. Typical of the genus, male and female plants are separate and all the plants I know are male. Reproduction seems to be mostly vegetative and the plant fruits rarely due to the apparent paucity of female plants and frequent fires. This species is somewhat unusual in lacking the spines, sometimes bearing leaves, which is characteristic of members of the genus. This is one of the ‘alphabet Eugenias‘; the as yet unnamed species A, B and C from southern KZN. All grow at Krantzkloof. Eugenia sp. B is only found in scarp forest in a narrow range from just north of Durban to Oribi Gorge in the south. It is locally common in its habitat and the Krantzkloof Nature Reserve supports a good population in the scarp forest immediately above some of the krantzes. The attractive bark on old specimens is pale and flaky. Leaves are opposite, thick and leathery and have lovely translucent gland dots when held up to a bright light and viewed with a 10x lens. This is a feature of Eugenias. New leaves are coral-pink and covered in silvery hairs. Male and female plants are separate in Eugenia. Flowers are white to pinkish with many stamens and the berries are fairly large and red when ripe. 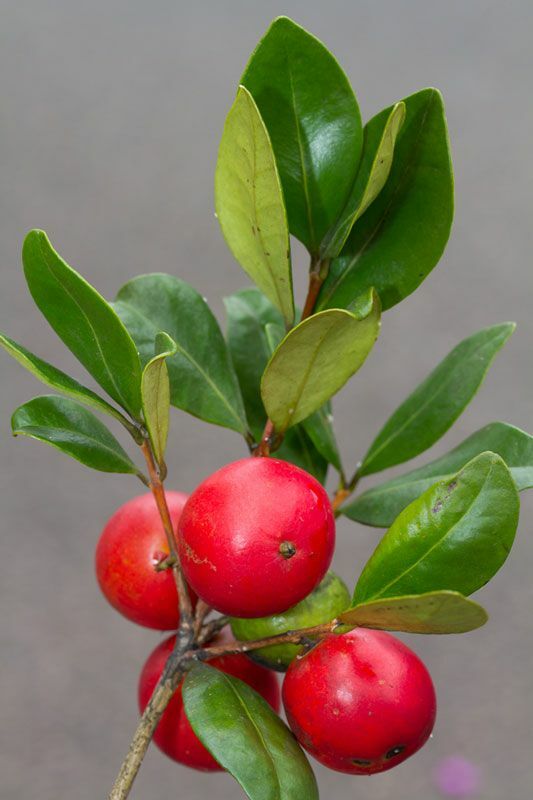 Like many Eugenia species they are good to eat; birds eat them too. 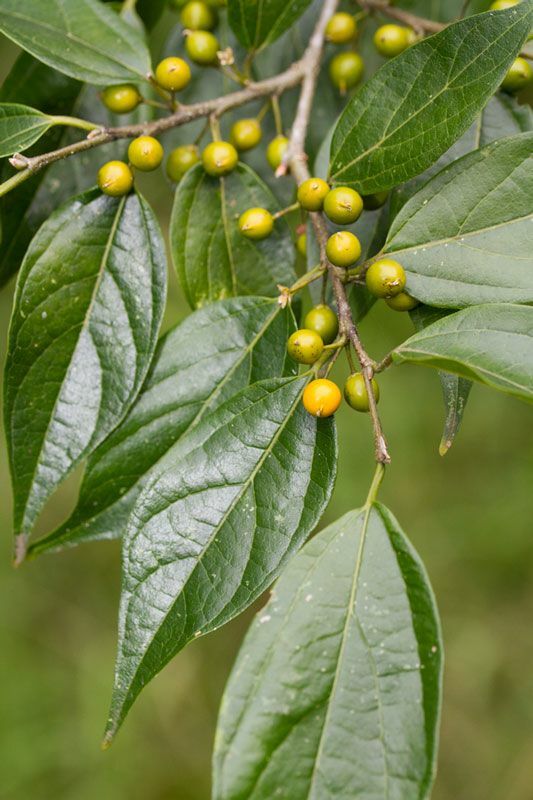 The invasive species Eugenia uniflora (Surinam Cherry), which used to be a popular hedging plant, has ribbed orange to red fruit and is sometimes found in forest and margins where birds have dispersed their seeds. The Krantz Myrtle grows well in cultivation although sadly it is infrequently used. 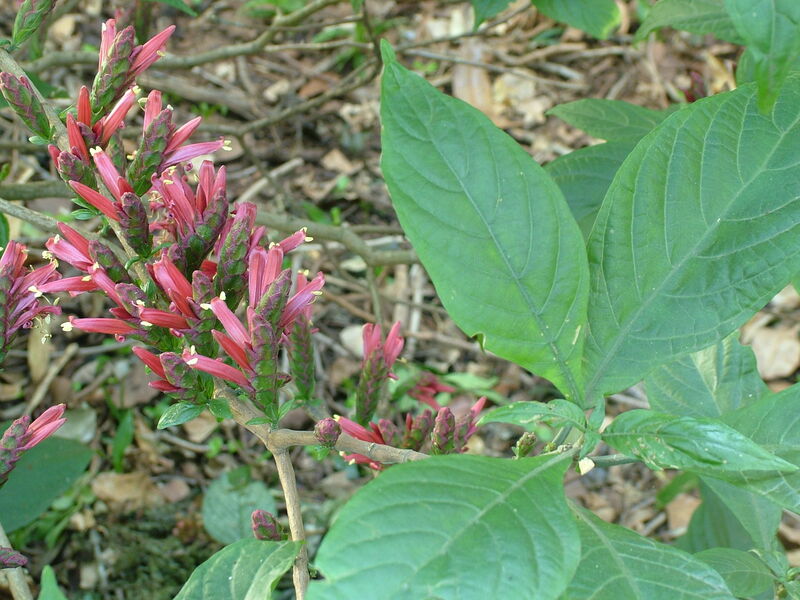 One of the most noteworthy plants growing in the Krantzkloof Nature Reserve is the Red Sunbird Bush. In South Africa the species is only known from Krantzkloof where it was discovered by David Styles and Rod Edwards in 2000. The Reserve’s population numbers a few thousand and plants are mainly found below krantzes on two south-facing rocky scree slopes, which are good fire refugia. The nearest population is inland of Maputo in Mozambique. It also occurs further north in Mozambique, Zimbabwe and in East and West Africa. It is interesting to speculate on its occurrence in the Reserve. Is the local population a relict of a formerly widespread distribution when the climate was different and forests were more connected? It is possible that M. pubinervia occurs as yet undiscovered in other deep gorges in KZN, which would support the formerly more widespread hypothesis. Or is the disjunct occurrence the result of a remarkable example of long distance dispersal; but then how did founder material travel so far as the explosive capsules discharge the seeds around the parent plants? The Red Sunbird Bush grows in dense colonies and reaches about 5m in exceptional specimens. Like the other two species of Sunbird Bushes it flowers in autumn and winter. It has large, opposite leaves and inflorescences are short and produced mainly behind the leaves on leafless stems. 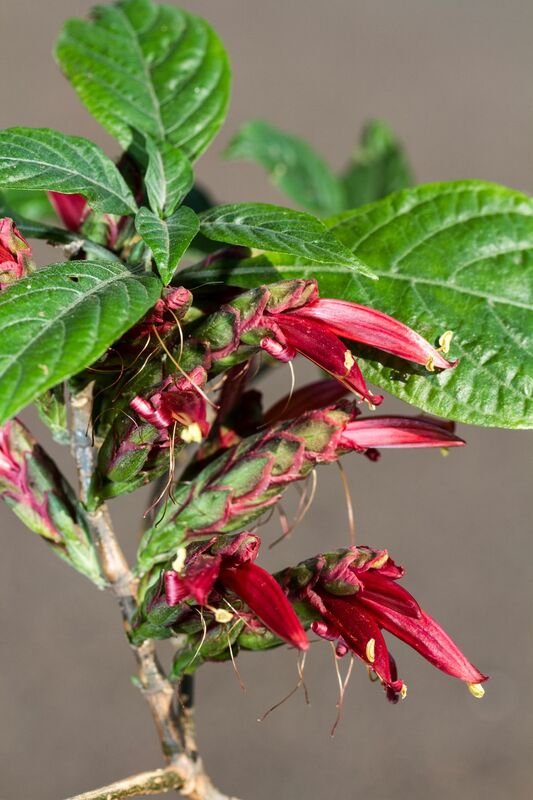 The two-lipped tubular flowers are pinkish-red and attractive to people and their sunbird pollinators, which are especially Olive and Collared Sunbirds at Krantzkloof. The Red Sunbird Bush makes a good garden plant and does best in lightly shaded areas, where it tends to reach about 2 m. It self seeds very successfully in cultivation; almost too successfully and has the potential to become a bit of a weed, which is fascinating given its rarity in nature. 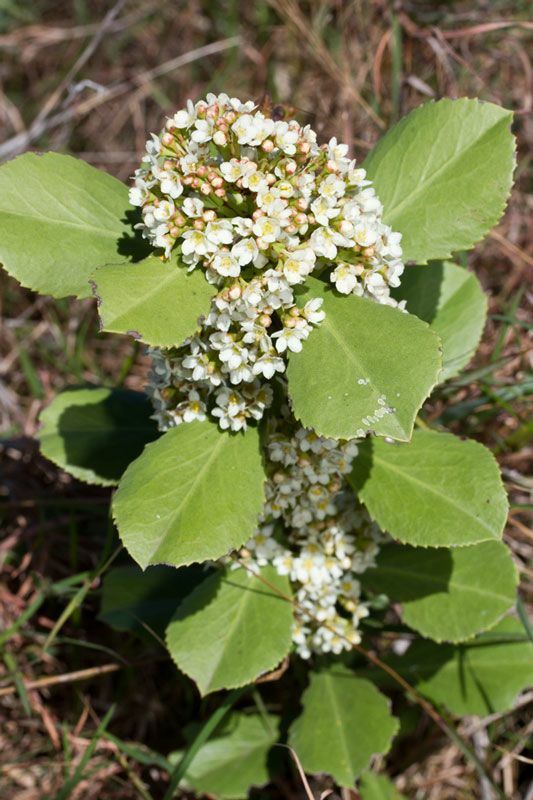 This uncommon small to medium, evergreen tree is one of two Cola species found in South Africa. It is endemic to low altitude, undisturbed coastal and scarp forests from the northern part of the Eastern Cape to the Ongoye Forest near Richards Bay. 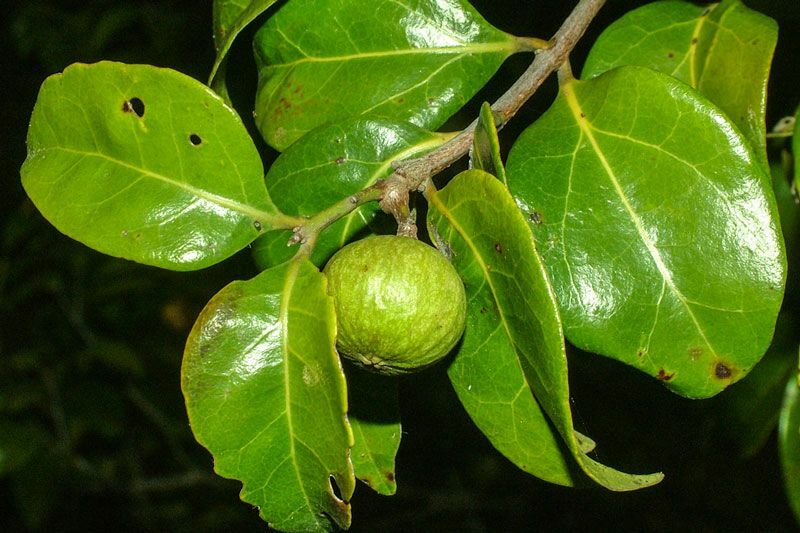 Locally it occurs sporadically at maybe half a dozen sites in forest and is most common in the Hawaan Forest where it is co-dominant with Cavacoa aurea (Natal Hickory). It is only occasionally encountered in the Krantzkloof Nature Reserve. 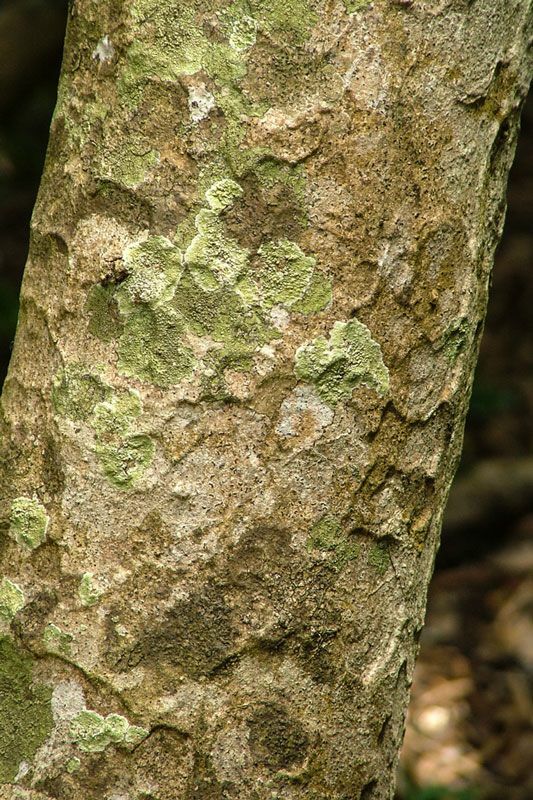 The tree is easily recognised by its bark which flakes in small pieces on mature stems. Leaves are dark green and usually long and narrow and a key identification feature is the swelling where the stalk joins the leaf blade. 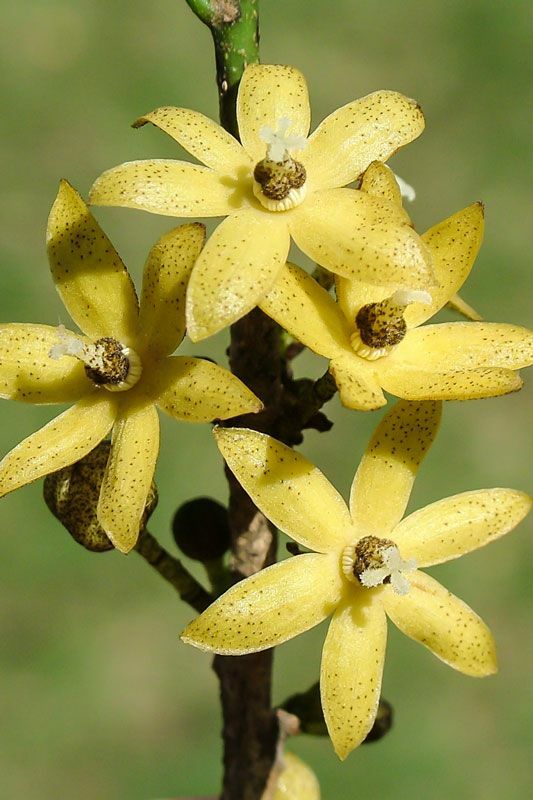 Flowers appear in spring and are yellow and unisexual. Fruits are rings of up to five leathery, yellow to orange carpels, which mature over summer and into autumn. 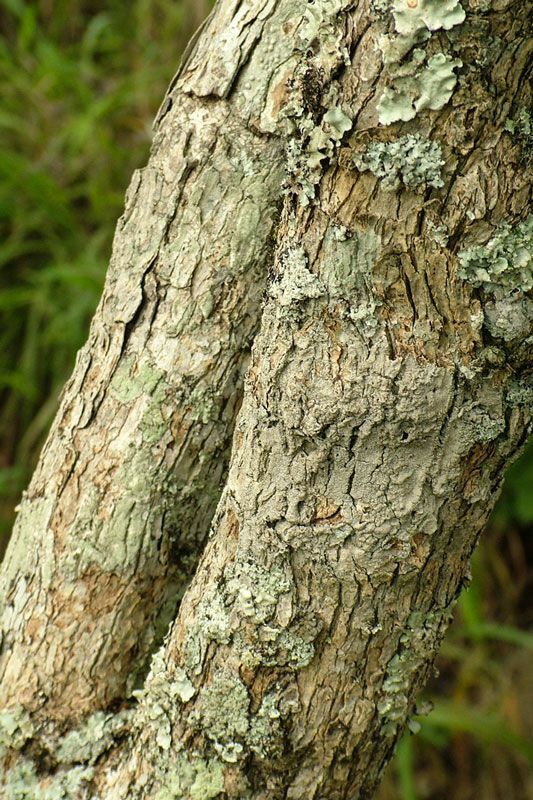 The hard wood is used for fighting sticks, hence the common name Coshwood. Extracts of the nuts of Cola acuminata and C. nitida were used to flavour and add caffeine to the original Coca-cola. 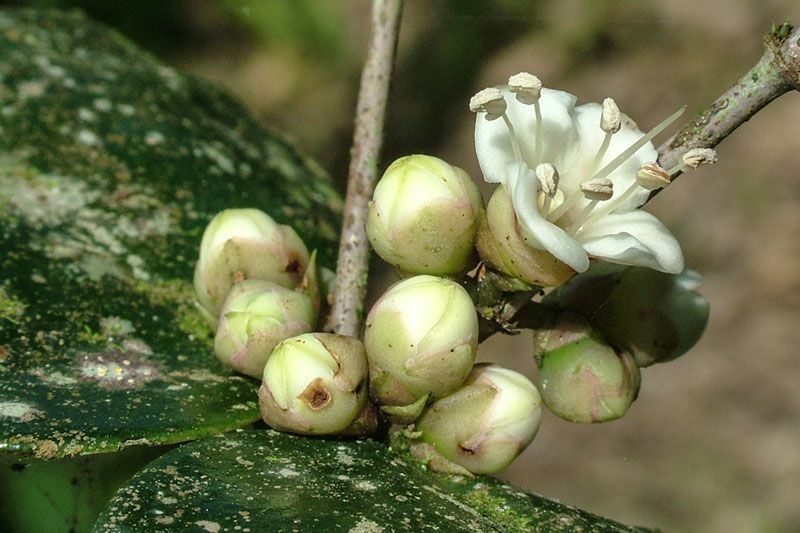 Cola is alternatively placed in a broadly defined family Malvaceae. The Pondo Rose-apple is a small forest understorey tree found in coastal scarp forest from the Eastern Cape to Durban, or more precisely to Krantzkloof. Its distribution is centred on the Pondoland Centre, a centre of plant endemism which extends from north of Port St Johns to Port Shepstone on Msikaba Formation sandstone. The species is also found at Durban and south of Port St Johns, where it is rare. North of Pondoland it is known only from two small populations in the Longshadows part of the Kloof Gorge system. The habitat is rocky and protected from fire and the trees are likely to be relicts of a once more widespread distribution when the climate was more favourable for forest expansion. It is hard to imagine fire penetrating the forest in the Longshadows today, but less than 100 years ago this was a much more open environment with the forest confined to fire refugia. Fewer fires, as a result of landscape fragmentation, and carbon fertilisation has probably caused woody plants to replace former grasslands. The species is easily identified by its leathery, shiny, dark green more or less round leaves, which have very short stalks. The leaf margin is tightly rolled under. Flowers are fairly small, attractive and white tinged pink. The fruit is oval and ripens dark purple. They are tightly clustered on the branchlets. The common name rose apple is usually used for certain species of Syzygium and its application here is presumably due to the superficial resemblance of the Pondo Rose-apple and its fruit to a Syzygium species. 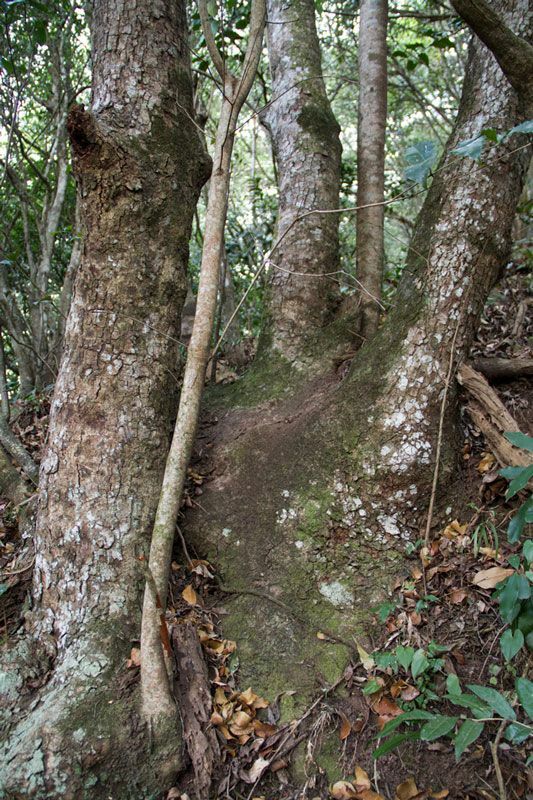 The three Witch-hazels that occur in KZN are generally uncommon in the province. They are all attractive, but the Splendid Witch-hazel really deserves its moniker. Trichocladus means hairy branch and this is an obvious feature of the witch-hazels, especially in the young parts. Splendid Witch-hazel flowers appear in spring, sometimes in profuse clusters, and are fairly large and scented. The white petals are ribbon-shaped and crinkly and usually have purple-mauve bases. The species is endemic to South Africa and Swaziland and grows in scarp and mistbelt forest and margins from the Eastern Cape to the Limpopo Province. Specimens can reach 30m in height, but in the Krantzkloof Nature Reserve they are typically much smaller. Fruits are small, brown dehiscent capsules set in a cup-like calyx. Mature leaves can be opposite, sub-opposite or alternate, confounding identification. On the other hand the narrowly ovate to lanceolate shape with a raised midvein on the underside and long, tapered apex is fairly distinctive. Medicinal witch-hazel is used by Native Americans and included in many commercial healthcare products and is extracted from a North American species, Hamamelis virginiana, which is placed in the same family. Reaching 25 m, this large canopy tree is the tallest member of the Protea family in South Africa. It is a rare species found at low densities in scarp and mistbelt forest from about Port St Johns to Limpopo. It also occurs disjunctly in Madagascar and in the Western Cape from George to Knysna, where the majority of the South African population is found. The Protea family is ancient, having arisen over 100 million years ago, hence its occurrence in Madagascar, South Africa, South America and Australia, all ‘fragments’ of the Gondwanan landmass. 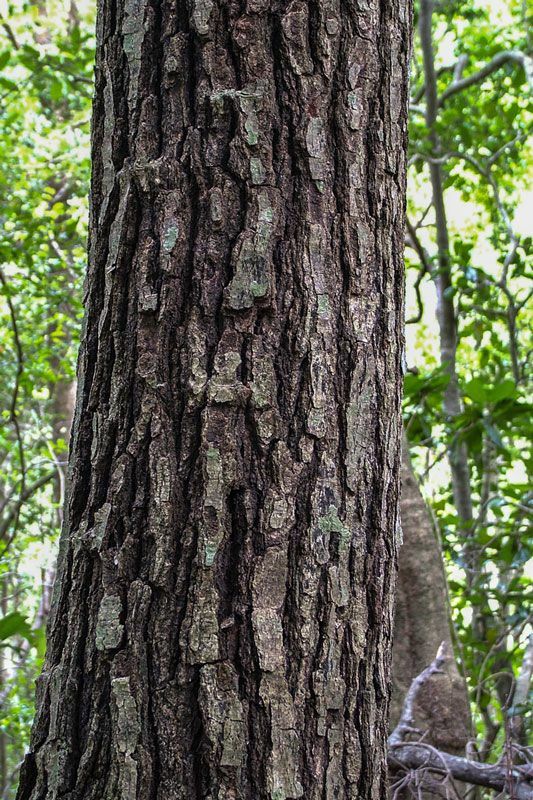 In the Krantzkloof Nature Reserve this tree is occasional in old, undisturbed forest. Mature trees have characteristic dark and rough bark, a good identification feature. Leaf identification is more challenging because leaves on adult plants differ from those on young plants and on coppice growth. Those on mature plants are short and broad while on young plants they are lance-shaped. Both are wavy and new growth is reddish. Flowers are nectar-rich, attractive to insects and produced in creamy-white to pinkish, pendent catkins. These develop into nutlets set in white to yellowish hairs. The wood is sweet-smelling, beautiful with broad rays and resembles the European Beech Fagus sylvatica. Given the rarity of the Terblanz Boekenhout in KZN, sustainable harvesting isn’t an option. This is a medium to large, deciduous forest tree which may reach 30 m in height. It occurs in low altitude forests from the Eastern Cape (Port St Johns) to tropical Africa. It is generally uncommon and sparsely distributed as in the Krantzkloof Nature Reserve, but locally there is a sizeable population in the Empisini Nature Reserve at Umkomaas. The stem is fairly smooth and some specimens are supported by substantial buttresses, an adaptation which provides extra support on shallow soils where strong winds can topple trees. Leaves are alternate, somewhat rough, have a long drip tip and are three-veined from the base. Contrasting with C. africana, leaves are usually noticeably larger, margins are usually entire, or almost so, and the base is only weakly asymmetric. Flowers are small and quite non descript. Fruits ripen yellow-orange in late summer and are very attractive to frugivorous birds. The wood apparently has an unpleasant smell even when decaying on the forest floor. Richard Boon is well known not only for his outstanding book Trees of Eastern South Africa – A Complete Guide but also for his environmental work at WESSA in the 90’s and since 2000 as part of the Environmental Planning and Climate Protection Department at eThekwini where he heads up the Biodiversity Planning Branch. 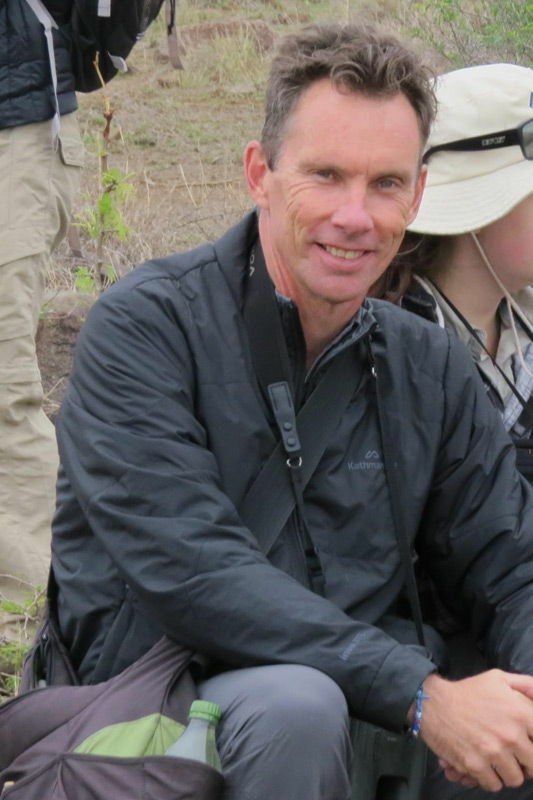 Richard is a practical botanist with over 20 years’ field experience. He also enjoys photographing plants and other natural subjects.